Self-driving cars in Salt Lake City? Downtown chosen to be lab for ‘smart city’ wireless technology. (Francisco Kjolseth | The Salt Lake Tribune) Kobus Van der Merwe, center left, associate professor in the University of Utah's School of Computing and co-director of the school's Flux Research Group, leads the team that will build a wireless-technology testbed in Downtown Salt Lake City for the next generation of wireless technology. Researchers will be able to test the next generation of wireless devices, from high-speed transfers to self driving cars. (Francisco Kjolseth | The Salt Lake Tribune) The Catmull Gallery at Warnock Engineering Building at the University of Utah serves as the backdrop on Monday, April 9, to announce POWDER: Platform for Open Wireless Data-driven Experimental Research, as Salt Lake City becomes a testbed for the next generation of wireless technology. 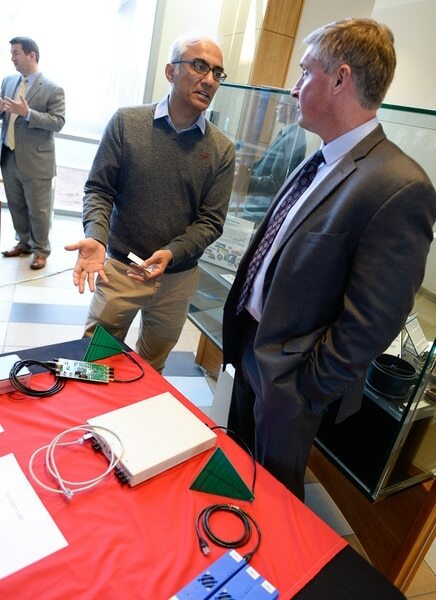 (Francisco Kjolseth | The Salt Lake Tribune) Rice University Professor Ashu Sabharwal, left, speaks with James Kimberly of National Instruments, following a press event at the University of Utah on Monday, April 9, 2018, to announce POWDER: Platform for Open Wireless Data-driven Experimental Research, as Salt Lake City becomes a testbed for the next generation of wireless technology. (Francisco Kjolseth | The Salt Lake Tribune) Dr. Erwin Gianchandani, Deputy Assistant Director for Computer and Information Science and Engineering (NSF) talks about plans for downtown Salt Lake City to become a testbed for the next generation of wireless technology during a press event at the University of Utah on Monday, April 9, 2018. (Francisco Kjolseth | The Salt Lake Tribune) Rice University Professor Ashu Sabharwal discusses the future of wireless technology during a press event at the University of Utah on Monday, April 9, 2018. (Francisco Kjolseth | The Salt Lake Tribune) Downtown Salt Lake City will become a testbed for the next generation of wireless technology, with nodes set up from West Temple to the University of Utah for wireless signals - a place where researchers can test data transfers, sensors for self-driving cars, and other new tech in an open urban environment. (Dan Hixson | University of Utah School of Engineering) Kobus Van der Merwe, associate professor in the University of Utah's School of Computing and co-director of the school's Flux Research Group, is leading the team that will build a wireless-technology testbed in downtown Salt Lake City. The testbed will allow researchers to road-test the next generation of wireless devices, from high-speed data transfers to autonomous vehicles. Instant internet access, self-driving cars, flying taxis — all kinds of new and unimagined technologies might be possible, thanks to a wireless test lab to be built through a swath of downtown Salt Lake City. Van der Merwe’s team of researchers, working with Houston’s Rice University, will build a next-generation wireless platform to test new software and hardware on a city-size scale. 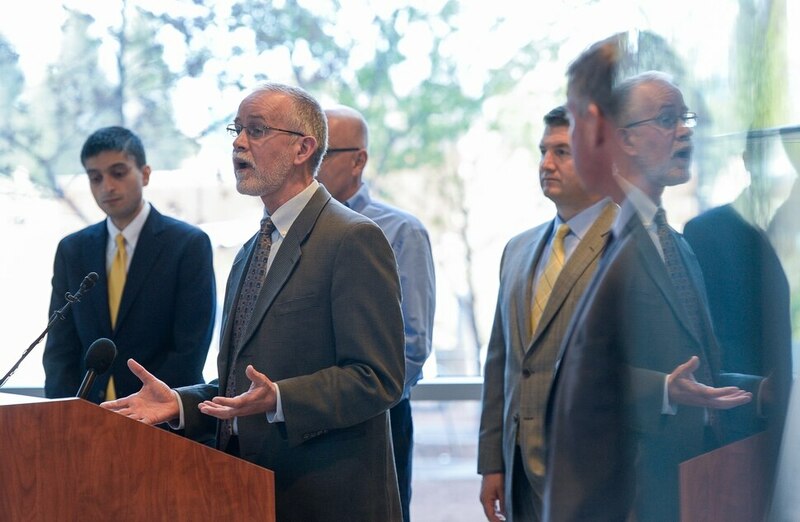 Salt Lake City’s selection for a test site, part of a program supported by the National Science Foundation and a consortium of 28 networking companies and associations, was announced Monday at the U. campus. The test bed, to be built over the next three years, will cover an area from West Temple to the University of Utah campus and from 2nd Avenue to 500 South. There also will be 60 wireless nodes on U. buses and city-owned vehicles, including sanitation trucks and parking-enforcement cars. An official with the National Science Foundation said the platform could help researchers road-test ideas as unknown now as smartphones were a dozen years ago. The possibilities are endless, Van der Merwe said. The federal government, through the NSF, is putting up half the $100 million to build test beds at four locations nationwide as part of the Platforms for Advanced Wireless Research (PAWR) program. The remainder will come from the wireless industry, Gianchandani said. Van der Merwe said the platform, with the acronym POWDER (Platform for Open Wireless Data-driven Experimental Research), will be deployed around the U. campus in the first year, and through downtown and on vehicles in the second year, and fully built by year three. The platform will be built in partnership with Rice University’s massive MIMO (multiple-input, multiple-output) antenna arrays, called Reconfigurable Eco-system for Next-generation End-to-End Wireless, or RENEW. Another test bed is being built in a square-mile space in New York City’s Harlem neighborhood, by teams from Rutgers, Columbia and New York universities. A new round of applications will be conducted to pick two more locations. The U. cites Van der Merwe’s Flux Computing Group as one reason Salt Lake City was chosen to be a test site. Another reason is a collaboration of local partners, including the Utah Education and Telehealth Network and the U.’s internet technology department, providing fiber infrastructure and monitoring. 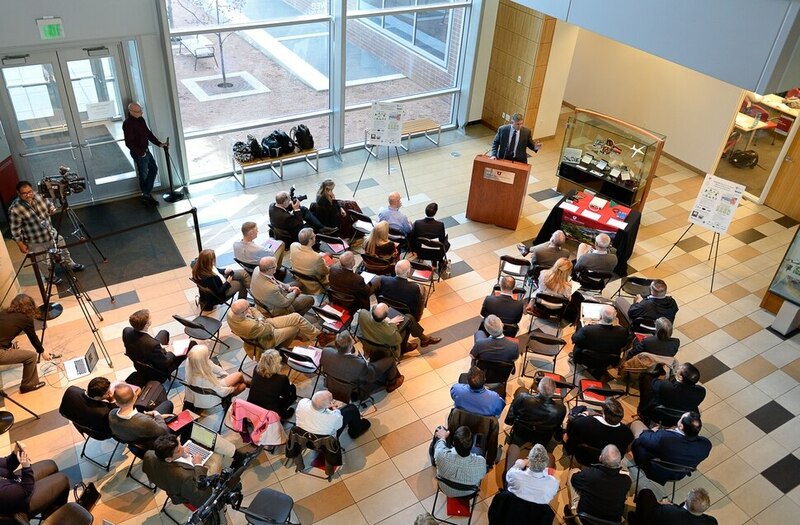 An assortment of tech firms will be providing equipment, software and platform services.